We are engaged in providing our clients with Aluminum Tripod Stands that are procured from the trustworthy sources, who make these using high quality raw material such as brass and aluminum. These products are also available in a powder coated finish and are especially developed for providing maximum stability and strength. We provide an extensive range of portable and possesses height adjustable Tripods. 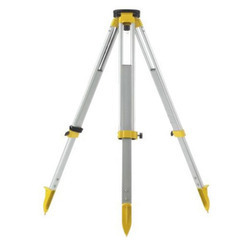 These tripods are available in multiple forms such as wooden, aluminum, fiber glass or elevated. Further, these are also offered in customized forms as per the requirements of the clients in beautiful and elegant designs which conform to the latest industrial standards at the most competitive prices. Janak Positioning & Surveying Systems (Pvt) Ltd. Being a customer oriented organization, we are highly engaged in wide range of Survey Tripods. We have range of high quality Telescopic Tripod Stands with us.